The Lynx lost again today – this time against the Mercury, at home: 80-72. 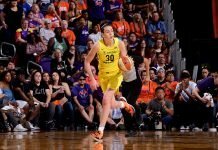 It’s the first time Phoenix has beat Minnesota since 2011, and the Lynx have lost two straight, and three of their last four games. Foot note: it was Monica Wright’s first time playing for Minnesota this season after knee surgery April 25. Fans at Target Center gave her a standing ovation when she took the floor. On the flip side, the Shock have now won four consecutive games after besting the Storm, 85-79. Foot note: Skylar Diggins lead Tulsa with a career-high 26 points. The Sun are also on a roll after squeaking by the Liberty, 76-72. Connecticut has won five of their last six games, while New York has won one out of their last five games. I thought the Liberty would be better this season. Atlanta continued their winning ways, upending the Mystics, 75-67. Natasha Howard has emerged as one of the league’s top rookies. As the Lynx are struggling, so is Maya Moore.